Mayor Jim Hovland has been at the helm of city government in Edina since 2005. Meanwhile, his wife LaRae Ellingson Hovland has enjoyed a fulfilling career as a French teacher in the Rosemount-Apple Valley-Eagan school district. She started there in 1981, the same year as fellow French teacher Linda Albertson. Since then, the two have led dozens of trips to France. These educational trips were initially only for their high school French language students. More recently, the two began to co-lead separate adult trips to France for friends and friends of friends. Ellingson retired from teaching in 2017 but still co-leads regular adult trips to France with Albertson. The student and adult trips are similar in theme and locales visited but are different in format and experiences. For one, adults don’t require monitoring even though Ellingson notes traveling students come with teacher recommendations and are often high achievers who rarely exhibit discipline problems. The pair provides book suggestions to adults who wish to prepare in advance for what they’re going to see during their travels. But unlike the student trips where such preparation for the language, culture and history are mandatory, adults are free to discover as they go if they so choose. The pair’s upcoming adult trip in September will take travelers to Bordeaux for wine tastings, sightseeing to historic places and shopping. 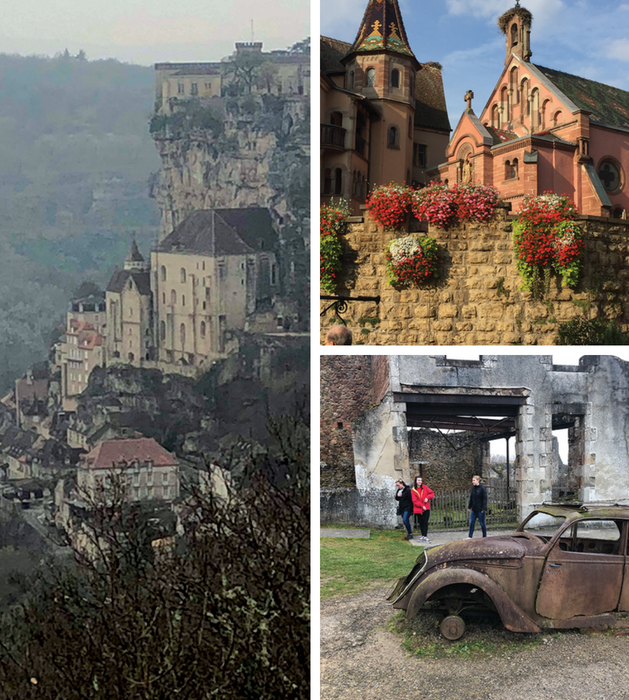 Then on to Dordogne, a “land of castles and prehistoric caves,” followed by visits to Basque area and Spain to explore more history, culture and cuisine. A 2019 trip is set for excursions to Normandy, Brittany, the Loire Valley and Paris. Albertson notes traveling with experienced guides is more efficient. “You never spend time looking for parking or getting lost on the freeway,” she says, as you might when traveling on your own. “We are there to be a conduit into the culture,” she explains, helping Americans discover places in the French interior they might not find otherwise. Some of the exciting destinations include Mont St. Michel where legend has it that the tide comes as fast as a galloping horse and a troglodyte village that looks as if it could be a movie set created for a scene in Lord of the Rings. Other parts of the experience include sampling French foods from each region. Things like chocolates, truffles and cheeses (varieties said to include one for every day of the year), and of course, wine. Years of combined travel experience along with being fluent bilingual travel leaders have ensured successful, educational and memorable trips for students and adults alike. Both groups experience historic and breathtaking sites. But unlike students who are also being taught how to travel on their own, how to navigate a subway or train station and are required to lug their own suitcases and live with host families—adults travel in the comfort of a tour bus, sleep in hotels or castles like the Chateau de Chissay, enjoy picnics and gourmet meals. And again, also wine.